He travelled far and wide and was unable to procure forgiveness to heal his weary heart. 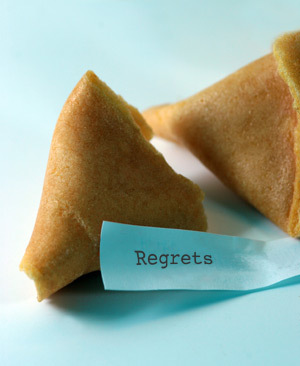 As I mentioned last time, regret is natural, even necessary when we sin. But what do we do when we can’t let go of regret and the pain from our past actions? I like pastor McKeever’s advice: Repent of it. Learn from it. Then put it behind you and go forward. Paul was a man that could have had regret consume him. He had persecuted Christians to death before his conversion. He learned to forget what was behind and strained forward for what God had for him. How does one press on? By helping others caught in the same temptation… by volunteering time to help victims of similar circumstances… by discovering your calling and pursuing it with everything you have. You can chase forgiveness around the globe or you can find it stretched out to you where you are… from a nailed scarred hand. Take it. Then put regret behind you and go forward.